The late Maureen O’Carroll, who played cello with the Sydney Symphony Orchestra. A NEW memoir has been published that celebrates the early life of Irish Australian cellist Maureen O’Carroll, who died in 2012. Born in the Sydney suburb of Balmain to Irish immigrant parents, John and May O’Carroll, Maureen carved out a very successful career as a professional musician. She and her nine siblings all showed a gift for music and their parents saw this as the path out of poverty. Six of them, including Maureen, attended the NSW Conservatorium of Music High School and went on to become professional musicians. O’Carroll was drawn to the cello at a very young age, and would prop her brother Robert’s violin on a jam tin and play it like a cello. At 17, she joined the New Zealand National Orchestra and went from there to New York, where she performed with Frank Sinatra, among others. In 1974, she returned to Australia as a single mother of three. She played a blind audition behind a curtain (to avoid gender discrimination) and was accepted into the Sydney Symphony Orchestra. The O’Carroll clan. Six of the children attended the NSW Conservatorium Of Music. Being a child of two rebels who had fought for Irish independence, Maureen was deeply patriotic about Ireland. At one Sydney Symphony concert, she noted Rule Britannia was on the program and refused to play it. She placed her cello down and marched off stage, only returning at its end. The new book, A Musical Memoir of an Irish Immigrant Childhood, has been written by her daughter Leora although Maureen is posthumously credited as a co-author. “Even though her family endured hardships and poverty, my mother always had an optimistic outlook and her humorous takes on her childhood is what makes her recollections so enchanting,” Leora told the Irish Echo. “As an adult, I was working in New York City as a television writer and producer and decided to move to Seattle where my mother lived, so that we could finally work on this memoir. 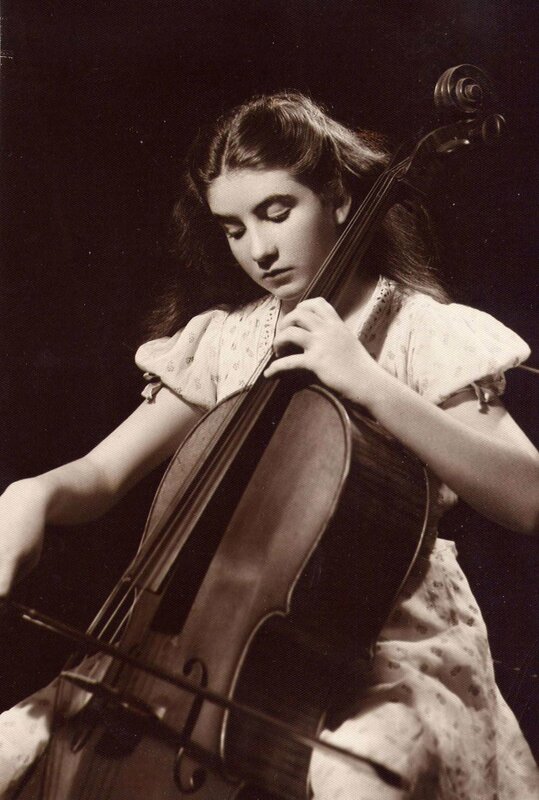 Maureen, aged 12, practicing her cello. In this extract, Leora writes about her father’s barber shop in Balmain which was called The Anchor. While hairdressing certainly took place at The Anchor, John O’Carroll ran other enterprises from the shop, which was set up in the family home on Darling Street. “The most popular feature of the Anchor, however, was not the barbering, but Dad’s other business – his lending library. Housed in a partitioned area at the back of the barber shop, was a small collection of books which included volumes of Macaulay’s History, The Complete Works of Benjamin Disraeli, and The Novels of Lord Lytton, all undoubtedly purchased as a lot by my father at an auction. “They were dry and unreadable Victorian works, but they weren’t meant to be read. One of dad’s sidelines was bookmaking. He wasn’t binding more volumes for the library but taking bets on the horse races. Bookmaking was an illegal activity, but this didn’t stop many shopkeepers from engaging in it, and my father enjoyed maintaining a unique system to disguise the betting; a borrowed book would be returned with the bet and money placed inside, and another book would be checked out ready for the next bet. “On Saturdays, the Anchor was a social centre for many local men, who were off work that day and would evade their share of household chores by insisting to their wives that they need a haircut or shave. But of course barbering wasn’t the main attraction. Saturday was the most important day for horse racing and consequently, a particularly busy one for the lending library. Leora O’Carrollm, who wrote the memoir with her late mother. “Clutching their Lord Lytton novels, the men would hover around the radio in the smoke-filled Anchor, engrossed by the announcer’s incessant monologue of race results from tracks around the country, and as this was thirsty work, they took turns carrying a billy can up the street to the London Hotel to be filled and refilled. “The lending library was enjoying a burgeoning patronage when my father fell victim to an informer. It was suspected that the woman who ran the comic book shop a few doors away didn’t appreciate the competition, and one day two policemen came into the Anchor – “We’re sorry Jack, but we have to take in your account books.” They probably were sorry too, also being patrons of the lending library. My father didn’t say anything but looking unconcerned, beamed one of his cheeky grins and proudly handed over his ledgers. All of his records had been written in Gaelic. “Gaelic was not a common written language in Australia and while many Irish people may have spoken the ancient Celtic tongue, there were very few who read it. An attempt was made by the authorities to find a translator. The search was unsuccessful, and even if there was someone who could translate Gaelic, no self-respecting Irish person would have ever agreed to be employed in such a fashion.